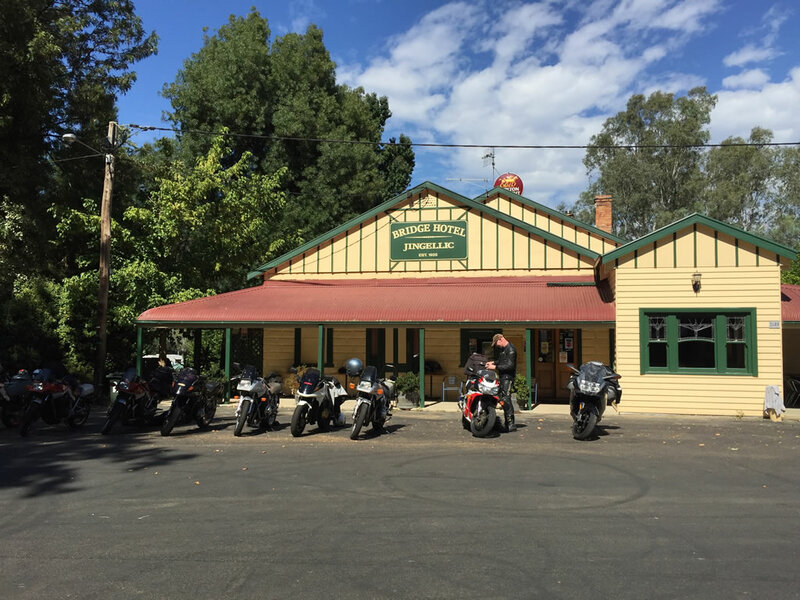 This ride report was originally published in the Volume 26 No 2 Feb-mar 2016 issue of the Motorcycle Tourers club magazine, ‘Chain Lube’. 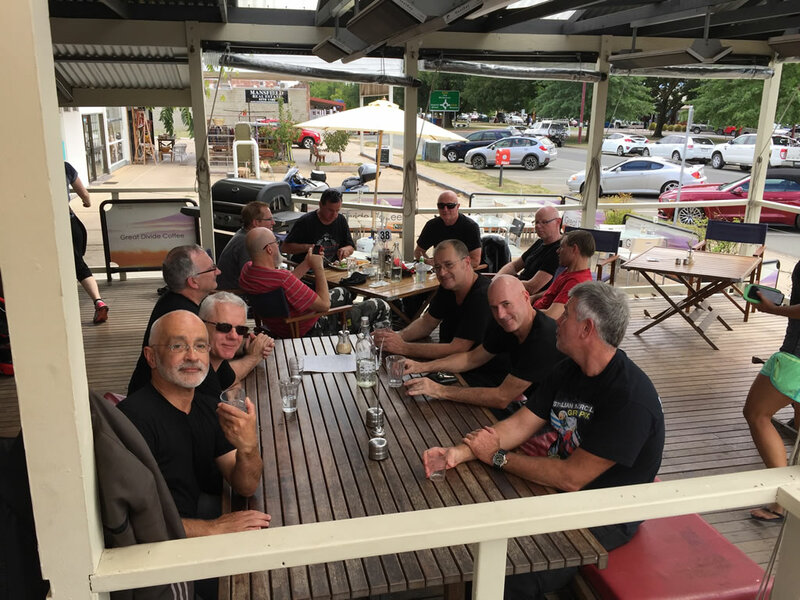 Sixteen club members (and Michael in his car) experienced seven days of fantastic touring surrounded by some of Australia’s best scenery. 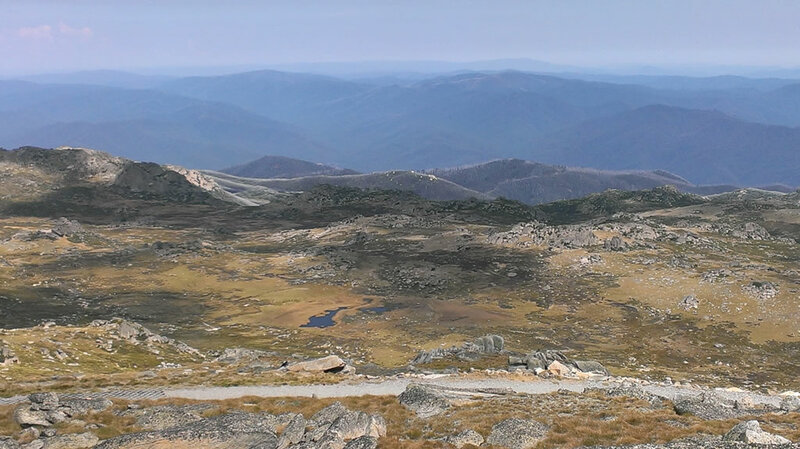 The decision was made for this year’s trip to base ourselves at Jindabyne for four nights, which meant we could maximise our time touring around the Snowies. 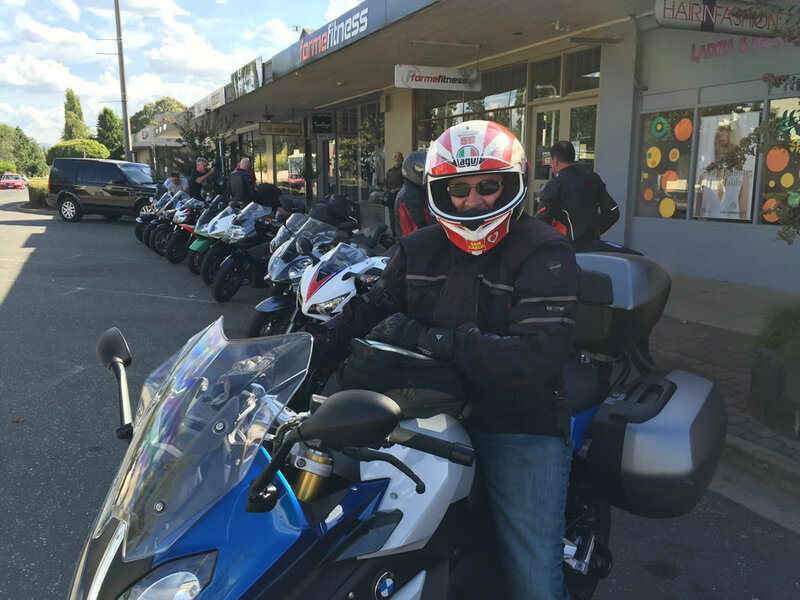 Day Two was spent getting to Jindabyne via Jingellic (a longer stop than we had scheduled!….thanks H! ), via Tumbarumba & Adaminaby. Day Three meant a blast down to the coast at Pambula where several of us took to the surf before lunch; after lunch was a very scenic route back up over the range at Brown Mountain (the road works can’t come soon enough), where we deviated the back way home via a cooling drink at the Dalgety pub. Day Four involved a round trip to Mt Kosciusko/Charlottes Pass, while several other of us had a wander round Jindabyne and the lake. Day Five gave some of us time to do a circuit to Adaminaby, while again some of us had a lay day. Day Six meant pack up day as we headed down the mountain back to Victoria where Omeo beckoned, (somewhere around Tallangatta, Max had a brain snap and kept on going home!). 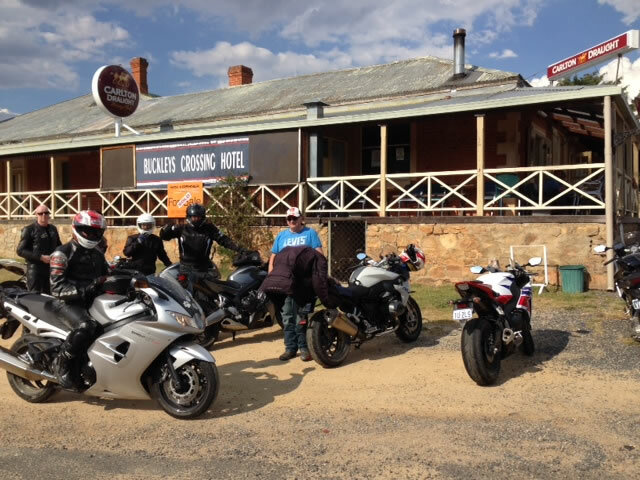 Day Seven and finally the group split at Omeo – with some going home via Gippsland with the rest via Mt Hotham. 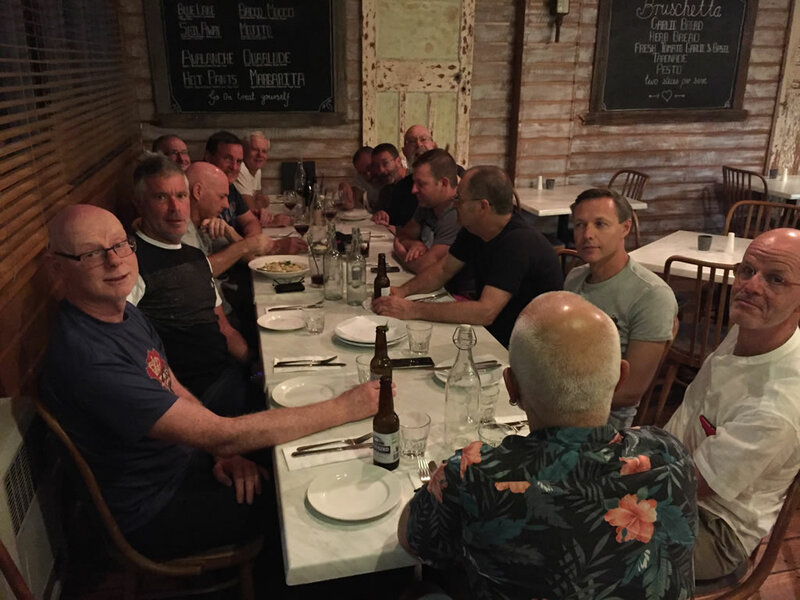 It was a great trip – aided by fantastic warm weather – and thanks go to Hosko for his organising skills in getting everything booked and Rolf and Christian for leading some day rides. And thanks to all who came for making it a really enjoyable time. Sunday morning in Yackandandah and barely a mouse was stirring on the main street at 7:30. Careful observations revealed that a couple of eateries were opening though, and by 8:30 even the community-run service station was up and running. The day was clear and sunny, already promising more high 30s heat to come as we waved goodbye to Phil R on his way back to Melbourne. 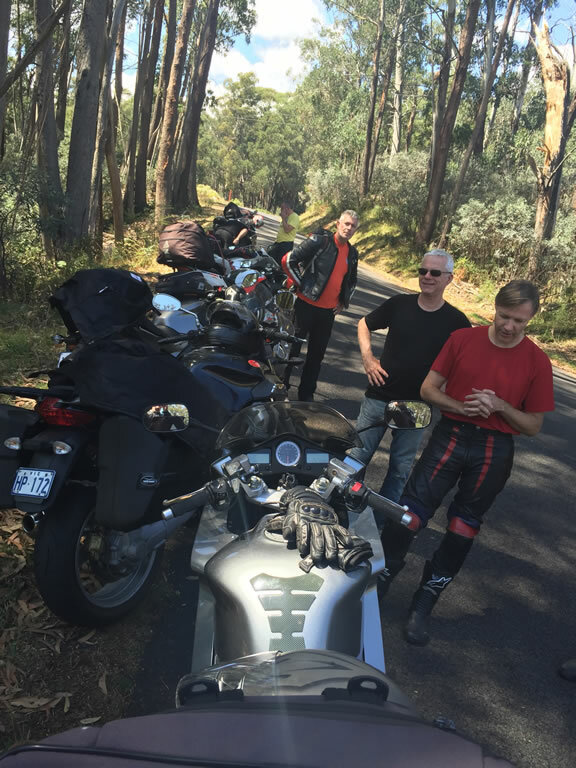 John M offered to go rear rider, and the 13 of us set off zig-zagging along delightful country B roads through Kiewa, past Tallangatta before turning north to head across Granya Gap, always an outstanding bit of road and glorious ride. Today was no exception, with clean, smooth surfaces wriggling their way up the hills and down the other side, not a single other vehicle on the road. The countryside looked great too, a little greener than normal for the end of summer. After the twisties, Darren B stopped in Granya to swap bikes with H, Tim L tagged along a bit further to mark the right-hander to follow the Murray eastwards, which is what I then did – blasting 60 km eastwards on the swooping, undulating roller-coaster ride along the south bank of the Murray River to the Jingellic Bridge. I’d been stopped there to wait for barely 2 minutes when my phone rang, “private number” . . . . “oh gawd, it’s the cops” was my first thought. But no, it was John M, calling from the Granya public call box, to say he and Darren had been unable to start H’s new BMW R1200RS after H had ridden off on Darrens’ almost-new MV F3 800. They were stranded. Literally at that moment, H arrived on the MV so I guessed “have you got the proximity fob for your bike in your pocket?” He couldn’t hear me, so killed the MV, then when asked again, hung his head . . . yup! . . ok, off you go on the 60 km back to Granya. Except, we now couldn’t get the MV started, and couldn’t call Darren for advice! I was about to offer H my VFR1200 when I thought to try pulling in the MV’s clutch lever – even already in neutral with the sidestand up, that’s what was needed! 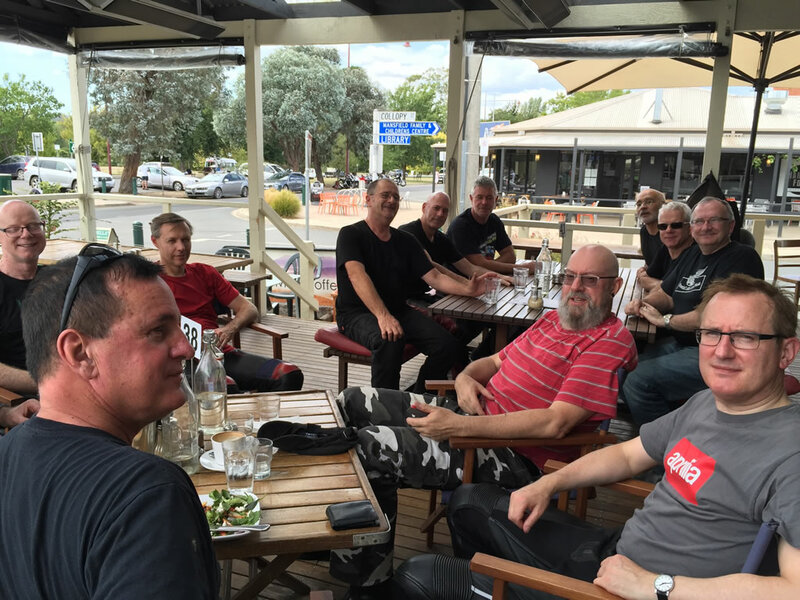 The rest of the group gradually assembled at the Jingellic pub to wait an hour and a quarter for H, Darren and John, as well as poor Tim L baking in the sun at a very quiet corner. Christian went for a swim in the full, fast-flowing and very cold Murray River while the grumpy publican refused the rest of us our coffee orders. 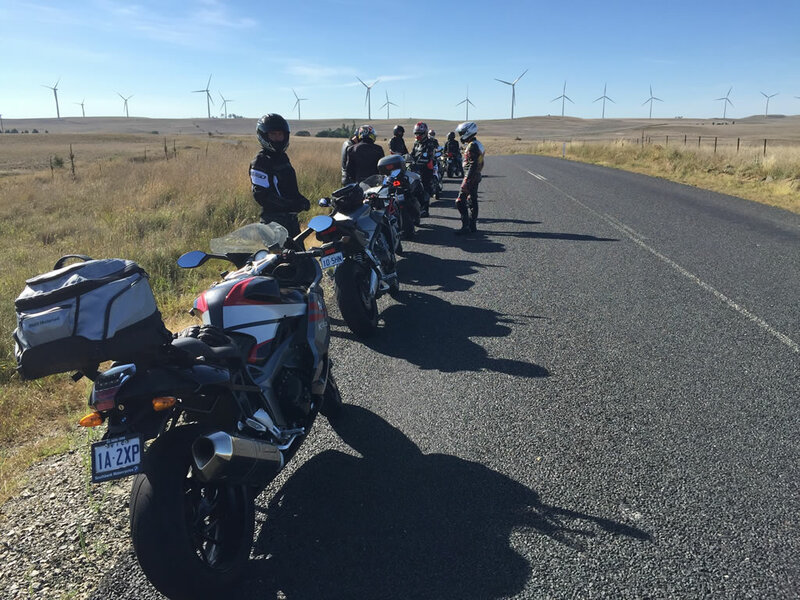 We killed the time drooling over a selection of immaculate Suzuki Katanas out front, a part of the Katana Australia Club who were celebrating their 30th anniversary. H was last to arrive, having had to overshoot to Walwa for fuel as the MV was running dry after that unexpected extra 120 km. That piece of Murray Valley Highway is superb, maybe the whole saga was just an excuse to ride it on the MV three times in one morning? 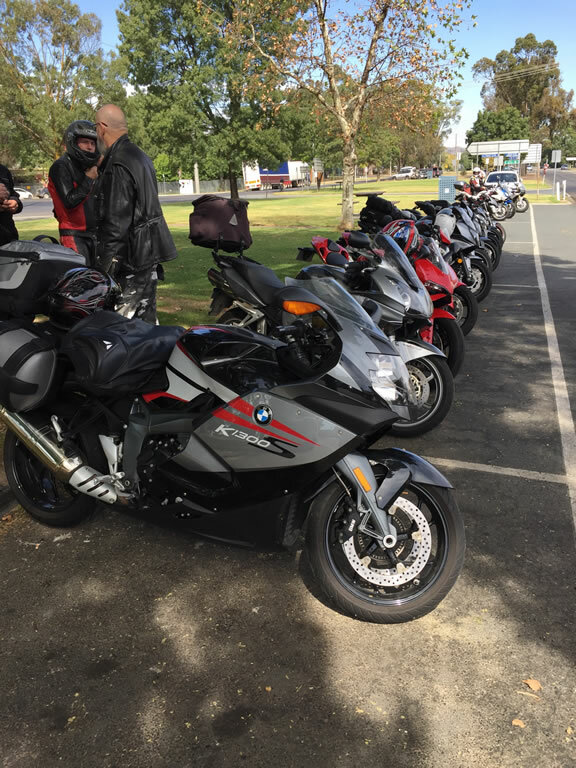 A quick blat along the 45 km of bumpy swervery to Tumbarumba ensued for lunch. Sadly, the 4 Bears Cafe was closed and appears to have gone bankrupt. The bakery kept most of us happy except Harvey and David, who had to choose the slowest sandwich-maker in creation up the road. The rest of us loitered about the servo for an extra 20 minutes or so as the temperature climbed into the mid 30s, then finally, we were back on the road! South to the turn-off up the Elliott Way, up into cooler air before plunging down past the Tumut 2 station, then switch-back climbing seriously to 1,400m at the Cabramurra junction and the Snowy Mountains proper. A surprising number of caravans were lumbering up this narrow, twisty road, in one case, attempting to overtake another caravan! Pushing east took us out to the Snowy Mountains Highway and that glorious stretch of orange-marked hotmix wriggling south to Adaminaby. One of my favourite bits of road in Australia, it can seem more like a video game at times, often with vision completely around one, two or even three corners ahead, a perfect surface, minimal traffic, clear cool air, and stunning scenery. A lazy latte and ice-cream stop in Adaminaby set us up for the run south. I missed the Berridale turnoff so we finished up passing by Cooma before turning west to cruise into Jindabyne via some glorious lake views, remarkably, only 15 minutes later than the planned 4pm arrival giving us plenty of time for a swim in Lake Jindabyne. A planned very relaxed 400km day had turned into a lesson for ride leaders on why not to get too ambitious with group rides. Particular thanks are due to John M for his sterling efforts and patience as tail rider! Lazy breakfast with the elderly bus crew in Jindi. Off to the servo for juice etc and we gathered for the ride briefing. I think the bike mob were Rolf, Harvey, Peter L, Tim, Dewy, Darren, Peter H, David, Ian, Adz – think this was it (Ed??). We headed off to the coast via Yambulla State Forest. Adz had mentioned that he had never been to Eden – so we had a destination in mind. Headed south out of Jindabyne on the lovely Barry Way. Some curves and loose gravel to warm us up and keep us on our toes – then the road and hills open up. Long sweeping curves and valleys as we head west to Dalgety. The great day and excellent roads made for speed. Dalgety hasn’t changed much in 100 years – still not much more than a pub and a school plus a street and a scattered houses. Strange that it was in the running to be our Nations capital. There is a great book partly set in Dalgety – “The Trout Opera” named after a quintet by Franz Schubert. The opening scene has a couple of old fella toff lawyers sitting on the verandah of the Dalgety Pub having sundowners (rum and water) and watching the school children walk out of the rising evening mist on the river flat wearing trout costumes – very evocative. It was quickly through Dalgety to Maffra and across the Gunningrah Plain. On the ridge in the distance stands the Boco Rock wind farm. Hope to see of these majestic engines soon – such a great way to make power. Stopped in Bombala for coffee. Fell a little bit in love a local bloke named Cary and his dogs Shadow and Quin. Headed south on B23 (to Cann River) looking for the Rockton turnoff. Mr Google took me to a dirt track (should have checked the map a little better) – we did a U-turn and headed down the Imlay Road through several state forests. The road is a beauty and winds through the tall gums and clearings. The logging trucks have rippled the road nicely on many of the corners – I expect the road base wasn’t rated for a 30 tonnes of old growth forest. We ended up at Boydtown on the wonderful Highway 1 (my least favourite road). 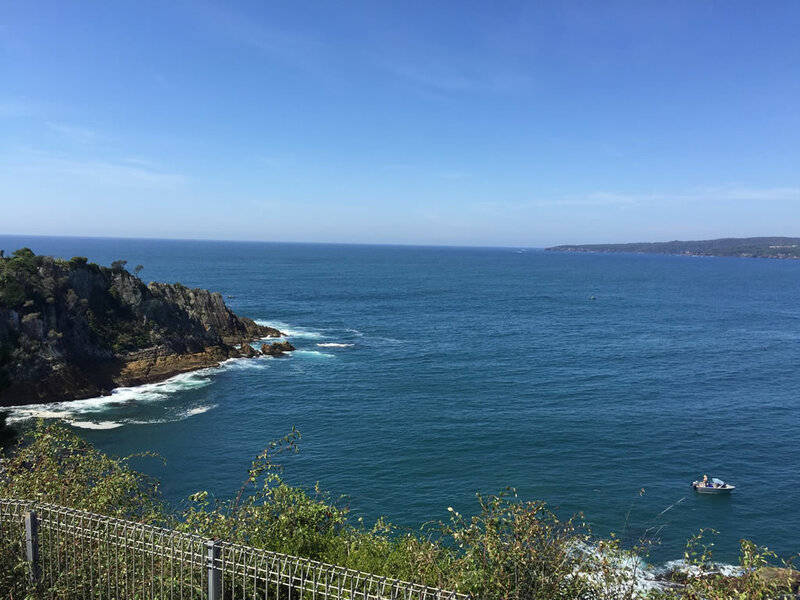 We skirted around Twofold Bay to the lookout in Eden then headed up the coast to Pambula for a swim at the surf beach. Great waves and some dolphins to keep us company. Lunch was a long lazy affair at a café in Pambula. Rolf led the ducklings up the Princes and then along the Wolumla-Candelo road. Always fun to head back up the eastern bits of the divide. Candelo is a lovely town nestling in a valley. We crossed the creek and headed west along Mogilla Road to The Snowy Mountains Highway and up Browns Mountain to Nimmitabel. 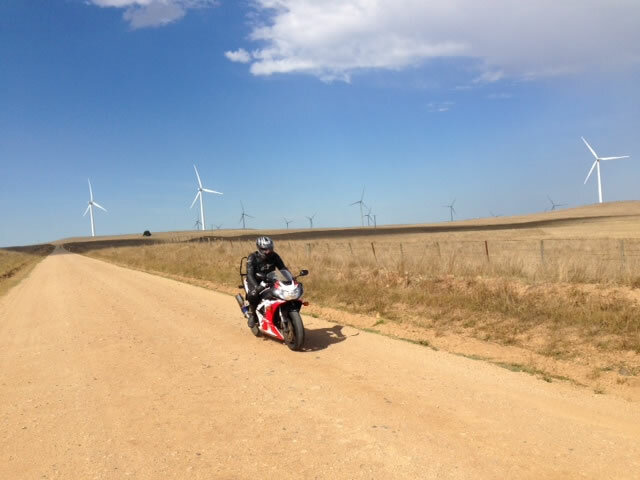 We headed back towards to the wind farm outside Dalgety via Springfield Road – only ~15ks of hard gravel. We stopped for a beer in Dalgety and then headed back to Jindi – a lovely days riding (and made better with a surf). After Christian’s Grand Tour Of The Bumpiest NSW Roads the day before, Tuesday offered a diversity of more gentle options. Christian buggered off to Wollongong for more bumps and roadworks. Max didn’t arrive from Mardi Gras, although Adz did manage it. Hosko and Glenda departed for Melbourne. Some of the group elected to poke around to the north of Jindabyne exploring the Yarrangobilly Caves and assorted back roads. 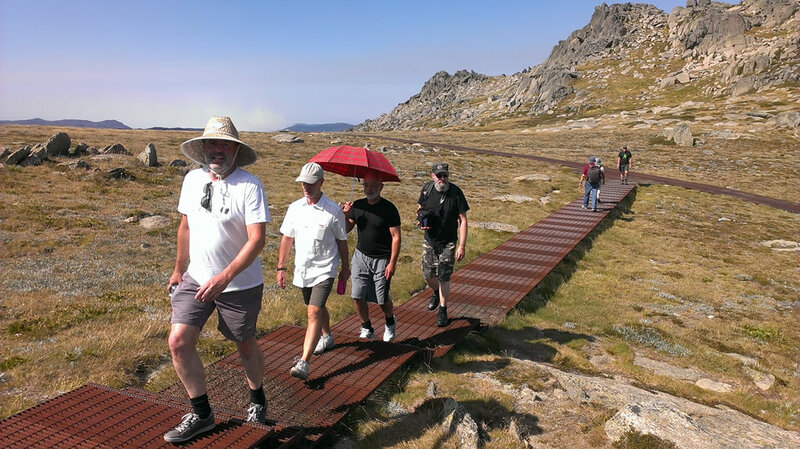 Others chose to sloth in Jindabyne, while the major splinter group prepared to tackle the Mt Kosciuszko Stroll. 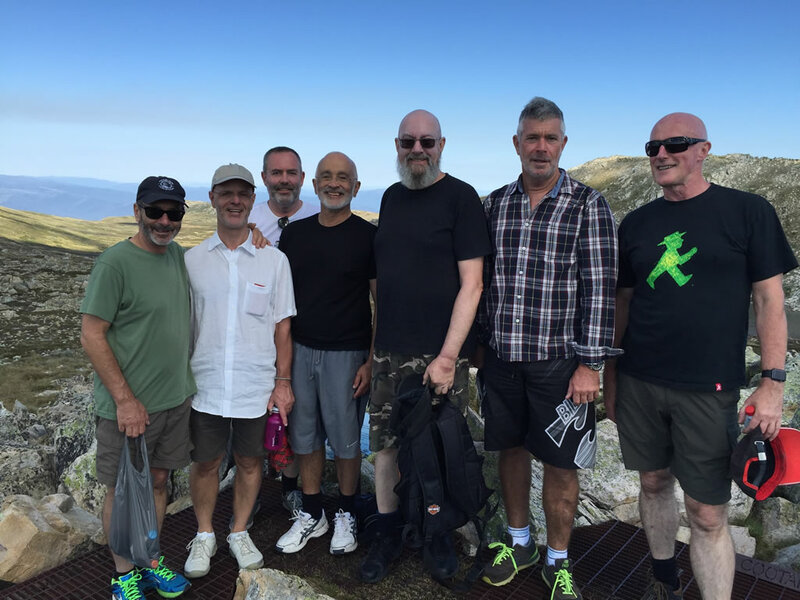 A total of 9 (Harvey, Michael K, Gary, Tim H, Tim L, Peter Ho, Adz, John M, Rolf) set out for Thedbo and the Kosciuszko Express Quad Chairlift which would whisk us up to 1,937 metres elevation. 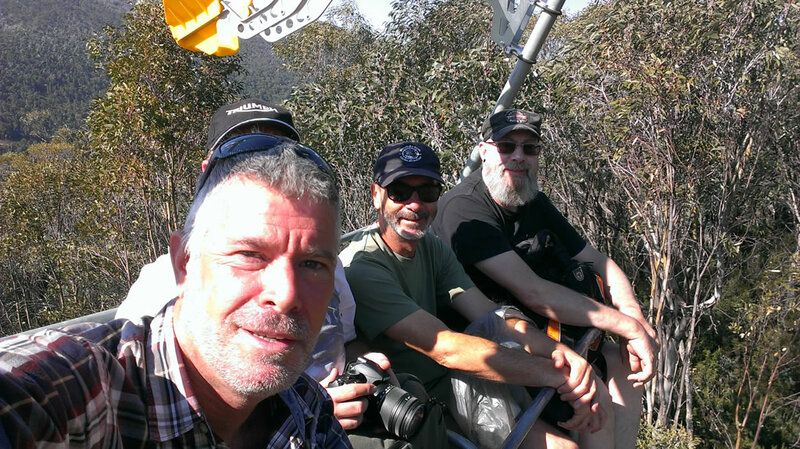 What, you thought we were going to climb the first 600 metres up from Thredbo? Don’t be ridiculous! 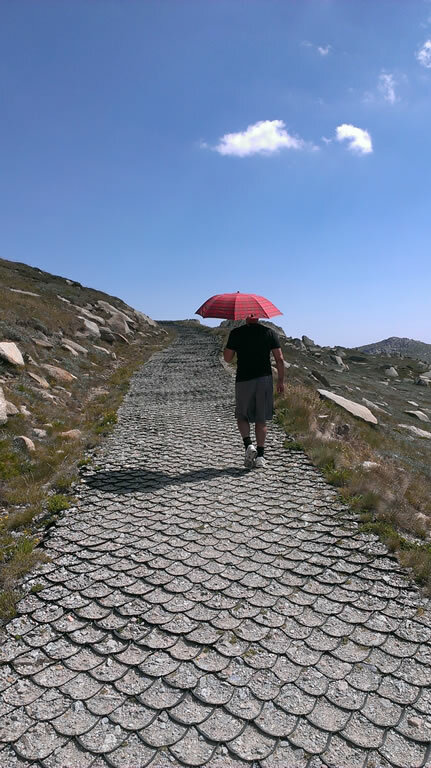 After the magnificent 35 km ride up from Jindabyne, a striptease in the Thredbo carpark quickly transformed bikers into hikers (or, in some cases, parasol-twirling catwalk strutters). We all piled helmets, boots, jackets etc into the conveniently located storage locker (Michael’s car), paid our $35 for the chairlift – on top of the $7 park day use fee – and set forth. After the scenic and strenuous chairlift ride up to Eagle’s Nest, coffee and cake were in order. The restaurant at the top of the chairlift is a bit 1960s and dripping with Austro/Germanic kitsch, complete with a stuffed, rather tatty non-indigenous eagle perched above the bar. Never mind, the staff were friendly and efficient. Perhaps because we were the only customers? Armed with waterbottles and protection against a blazing sun, we knocked off the 6.5 kilometre, 300m ascent to the top of Australia (2,228m) in about an hour and half. Apart from Adz that is, who turned back after 20 minutes to spend the morning riding chairlifts and some kind of mechanical bobsled thingy instead. The walk is a pretty easy stroll along a steel mesh catwalk, with a few steps thrown in and a gravelly bit at the end. The alpine scenery is grand and expansive, an almost complete lack of trees enhancing the otherworldly appearance. The whole Snowy Mountains region was under ice not so long ago, so the absence of trees is nothing to do with altitude, rather it’s a total lack of soil on the glaciated, granitic slopes. A bit like the treeless Nullabor Plain in fact, which has only millimetres of soil covering the limestone bedrock. As one discovers when one attempts to pitch a tent anywhere there on a windy afternoon! But I digress. 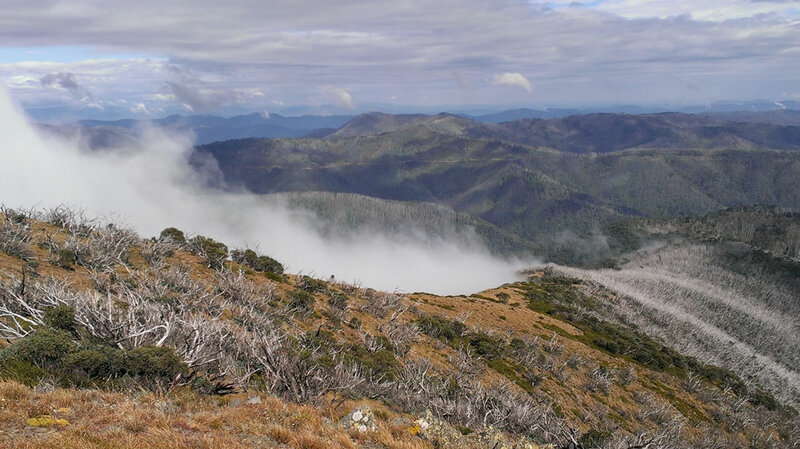 The Snowy Mountains Alpine Area is unique in Australia, in fact unique in the world, covers only 250 square kilometres, and has been steadily shrinking for the past 110,000 years since the last Ice Age. See it while you can! The air is clear, cute little brooks babble, wildflowers nod in the breeze, and for about 9 months of the year there are actually patches of snow up there. Not in March by the way. We summited at the same time as a boisterous school group of teens, along with assorted backpackers and pensioners. 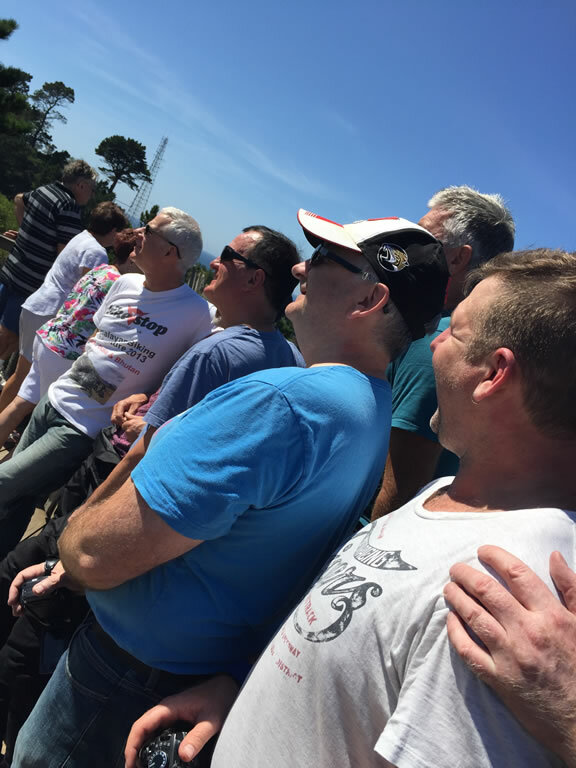 The top of Australia is quite a busy place, but we just had to look for Gary’s dashing bright red sun parasol to find our group from any distance. The 360o views north along the Main Range and south into Victoria are simply spectacular. Much selfie-taking and consulting of digital devices followed, even squeezing in a brief moment sitting on rocks communing with nature, before the 6.5 km trek back to the chairlift in the heat of the day. Lunch at Eagles Nest “our usual table please” followed, before the chairlift descent to Thredbo. We then wandered the deserted plazas of Thredbo for a while. Despite vigorous marketing of the area as a 365 days-a-year destination and presence of a dozen or so hotties on mountain bikes, it seems local businesses are doing it tough. Exertions of the day clearly took their toll, by the time we’d ridden back down to Jindabyne only Harvey and Rolf were up for the 70 km blast to Charlotte’s Pass and back. We were rewarded with a deserted, perfect hotmix surface sweeping it’s way up through Perisher to be the highest road in Australia, with views across to the eastern flank of Mt Kosciuszko from the termination carpark at Charlotte’s Pass itself. Apart from the jumping-off point for many multi-day summer hiking trails and epic cross-country skiing expeditions in winter, Charlotte’s Pass is famed as the coldest place in Australia, regularly getting below minus 15 oC, dipping to a record minus 24oC in June 1994. Every time I visit this part of Australia, I kick myself for not coming more often. From Melbourne to Thredbo is only 5 hours drive via the most direct, partially boring (Hume) route, easy fodder for a random long weekend. Why not, indeed! Last day in the mountains, what to do? 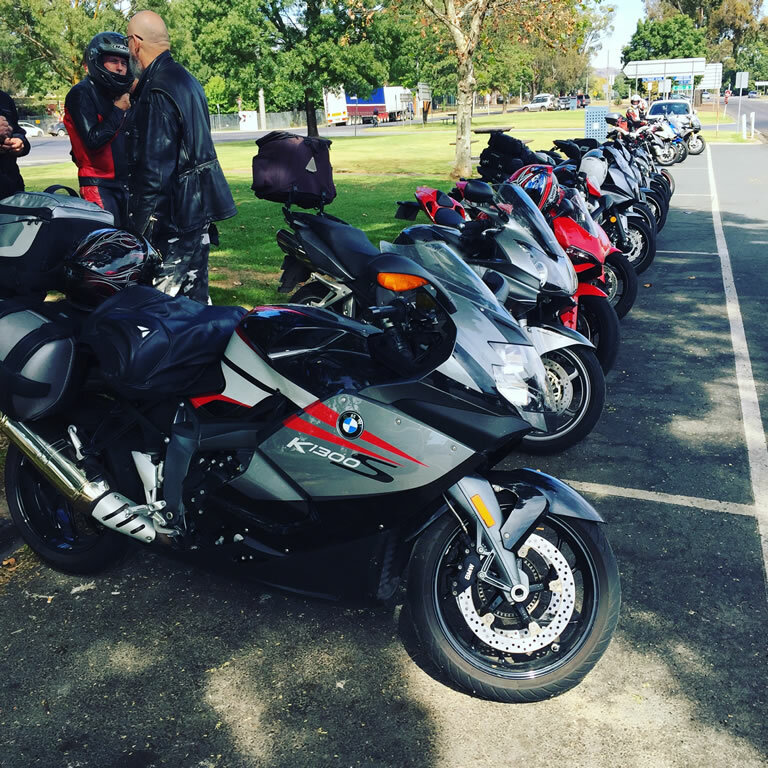 Nobody seemed to know, so when I said I was planning a lap of the best roads around, suddenly we had a group of 10 for the famed “golden triangle” of Jindabyne-Cabramurra-Khancoban-Jindabyne. Once again John volunteered to tail, although this time Gary spoiled his thunder. We headed east across the Jindabyne dam wall before looping north past Kalkite to Rocky Plains thence the Berridale road, seeing some classic alpine high plains grazing country along the way. Question: Where do the cows go in winter? Joining the Snowy Mountains Highway we blasted north past Adaminaby to do my favourite stretch of road again in reverse. The weather was perfect although a strong northerly headwind made it’s presence felt all the way to Kiandra, a goldrush town which boasted up to 15,000 residents in the 1860s, and was Australia’s highest town for over 100 years until Cabramurra was constructed for the Snowy Mountains Scheme. Kiandra had 14 pubs and boasts the first recorded recreational snow skiing in Australia, in 1861 (an event possibly related to the 14 pubs). Event the girls had a go, on skis locally made by Jens Olsen from Norway at Australia’s first ski manufacturing workshop. Several of the event winners were local Chinese, although an American won the first International Downhill Race in 1908. Cross-country skiing and ski jumping had already been introduced in 1878. In 2011, the International Ski Federation recognised the Kiandra Snow Show Club “for having organised the first Alpine ski races in the history of the sport”. The Kiandra goldfields had officially produced 50 tonnes of gold by 1905, unofficially, probably much more. The scenic dam constructed there by Chinese miners still supplies the Selwyn Snowfields with its snow-making water requirements. Turning left and winding down Link Road we pulled into Cabramurra to look at the view and for a certain thirsty scooter to top up from the card-operated fuel pump. Heading down the 65 km of memorable Snowridge Road towards Khancoban, I was a bit disturbed to see a sign warning of delays and advising Elliot Way to Tumbarumba as an alternative route. What?? Never mind, we charged on over the divide at 1,580m then down into the seemingly endless drop over the Western Fall, flip-flop corners and very little traffic, air temperatures rising steadily until pulling up for an early lunch at the Khancoban Shell, a good place to sit and watch the world go by. It was there I saw the official notice warning of “ongoing short delays of 2 hours” between 7am-4pm weekdays, “with the possibility of extended delays” on the road we’d just ridden. Clearly, we were blessed! From Khancoban it was a fantastic 108km back up over the 1,500m divide at Dead Horse Gap, past Thredbo and down into Jindabyne at a lowly 920 metres elevation. A stellar 330km, Adz’s first real look at the Snowy Mountains, and home in Jindabyne before 3pm, even beating Max in from Sydney. I wonder what the poor people were doing that day? Once again, as Peter Ho put it, “the Rolf and John show” hit the road, this time to depart the Snowies. 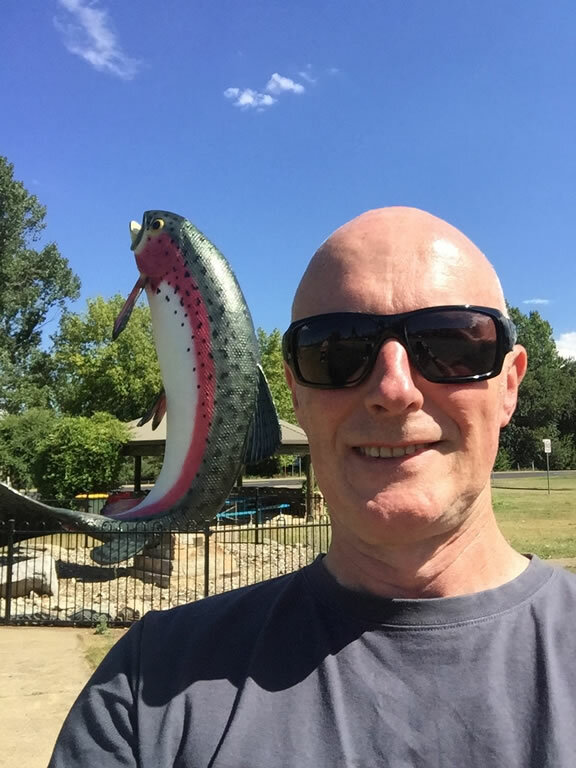 A scenic 220 km down the ranges through Khancoban to Tallangatta for fuel and early lunch, maybe a swim at Mitta Mitta, before slicing up the epic swervery south to Omeo, arriving before the forecast afternoon thunderstorms. Twelve bikes and one car. What could go wrong? Well. Adz experienced rear brake fade on the Triumph on the way down the mountains, with half the group stopping with him to investigate. The other half followed Max into the Khancoban Shell for fuel and coffee. After I’d been waiting 20 minutes at the Corryong junction and fearing the worst, Darren B texted me with an update. I headed into Corryong to wait, getting a warning “flash” from a Nissan Patrol along the way, first police car seen for 5 days (20 km into Victoria, welcome back!). Darren and Max were the first to arrive in Corryong, waved and continued on. The rest of the group started pulling up as I rode off, catching Max, passing the second police Nissan Patrol in a tight corner happily, and leaving Darren marking the turnoff into Tallangatta. Max turned off but somehow missed this fuel and lunch stop, later calling from Wodonga wanting to know where everybody was, then electing to continue to Melbourne down a drizzly and dismal Hume. Karma! 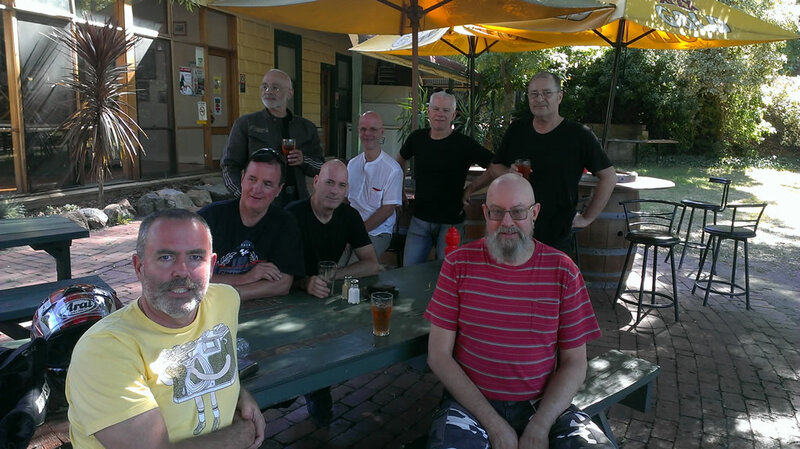 Adz also headed for the Hume, Gary and Michael K skedaddled for home, while the remaining 9 of us backtracked down to Mitta Mitta for a relaxed stop with a bit of swimming in the waterhole behind the pub. Two other bike groups were also stopped in Mitta, the place was heaving! The forecast thunderstorms were evaporating by the time we hit the remaining 107 km of glorious road south to Omeo. I got stuck into it, another favourite stretch of road for me, but still I was surprised when nobody else had appeared by the time I’d checked into the familiar Snug as Bug motel in Omeo. In fact, it was an hour and half before the group appeared, by which time I’d been listening for the medi-vac chopper for some time. First there had been a spontaneous drinks stop at the Blue Duck Inn, then a few kilometres further along, Harvey had hit a patch of sand on a left-hand corner and low-sided his CBR650F. Bike and rider had slid across the road and finished up in the ditch, remarkably, both were still rideable! Harvey had a graze on his left arm (mesh jacket dysfunction), the mother of all bruises on his left hip and thigh, the bike had scratches and a slightly bent clutch lever, but nothing was broken. Even the indicators all still worked. Yay Honda! Wounds were licked (or dressed, thanks tail rider Nurse John!) in the motel as thunder rolled overhead and the first fat raindrops fell just on dusk, then we headed for the Art Deco “Golden Age Hotel” (fourth version) for a great dinner. An eventful 390 kilometres! Like a space shuttle launch, the group was dropping off “stages” rapidly since yesterday, with H, Darren and Tim H taking the boring route back to Melbourne this morning. The remaining 6 of us headed up over Mt Hotham, then down into some misty cloud and damp roads for coffee in Bright. We copped some light drizzle on the way to Myrtleford, our only rain of the whole week. Harvey and John M left us there, the remaining 4 of us turning west through Milawa to arrive in Whitfield for a pleasant lunch at the Whitty Cafe. Northbound traffic was really building by this time, with long queues of frustrated drivers and riders heading the other way across the hills to Mansfield, then getting even worse by the time we hit Yea. Yay for a pleasant start to your long weekend! Let’s all leave Melbourne early to beat the rush! David W, Peter Ho, Tim L and I said our goodbyes in Yea, which became the official end of the ride and KosiHosko 2016. All up I did 468 km that day back to Collingwood, making a trip total of just under 2,600kms, barely a bad bit of road seen! Three roots for Hosko for (yet again) organising the whole thing!